I’ve been on a quest to un-worksheet my classroom, and I plan to document my journey here as I bumble and fumble along. 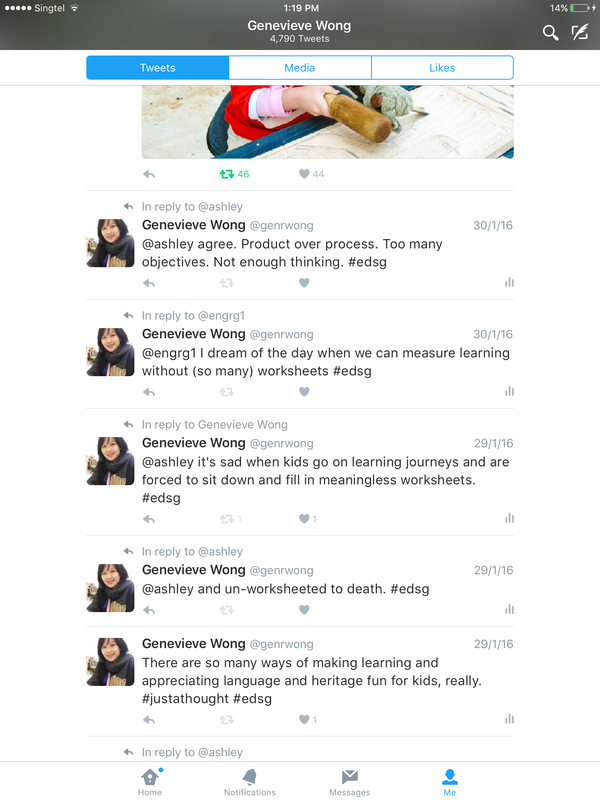 It started with this series of tweets, borne out of a deeper boredom with learning (and death) by meaningless worksheets. There IS something inherently sad about students who spend their days in class or on field trips hunched over meaningless pieces of paper, trying to fill up blank after blank. I feel especially strongly about the latter because of the paperwork involved to bring the students out. That time and effort that is wasted when the students are involved in meaningless activities at the destination. Example: You bring a class to the zoo and they do grammar exercises on nouns and pronouns that they could have easily done in school, just because you need an ‘English element’ for the inter-disciplinary field trip. What does that have to do with the place you’ve brought them to? How are they tapping that out-of-school experience in the best way possible? I don’t have anything against worksheets per se, I just wish there was less worksheeting and more room for deep discussions and activities that promote thinking and learning. In fact, I wish those sorts of activities were the heart of the classroom, rather than the hallowed stack of worksheets that the teacher needs to drag the class through in the name of exam preparation, for the purpose of file checks that seek to check if you have marked each correction and whether all your students have written their dates correctly. Too often, discussions are the first to be trimmed in preference for more written exercises. I understand the rationale, of course. Worksheets provide easy evidence of learning. Plus, they are easy to control and manage. You give the worksheets out, go through parts of them, and the worksheets come back. No messy questions, rabbit holes or chaos. Everyone loves worksheets, from parents to school administrators. Packages, or thematic worksheets, are even more loved. Need to teach XYZ? Find a package! Two opportunities arose recently that gave me a chance to change this. The first, a pilot project with the National Gallery that is, in many ways, a dream come through. It is not meant to be tied to any one subject and not arbitrarily inter-disciplinary. The only brief I was given was that it should promote critical and creative thinking through art. So we don’t have to force -fit say, Maths into the project and add an activity like counting the number of steps in the gallery for no real purpose. We don’t have to figure out a way to tie in a Social Studies unit, and creatively engineer some cognitive leaps so that we achieve many subject objectives. I’ll blog about the second opportunity when I’ve tried some of the things and thought them through. No worksheets. That was my first thought. Let’s have a project that is worksheet-less, and package-less. While the core of the project is in the questioning and the wondering, let’s find a way to capture/retain/cultivate (I haven’t found the right verb to use yet) student thinking and learning in a way that makes sense to the learning and to the learners. While planning the whole project using a UbD template, I turned to Twitter for help. What tools could I use to capture critical and creative thinking , I asked #edsg. I was willing to consider high- and low- tech options. Sheets of butcher paper? Or perhaps Google edtech? Google glass? Or Cardboard? Or Expeditions? I had visited the Google shophouse last year and was quite taken by the Google Cultural Institute as well as the possibilities of using augmented reality. Could a Google tie-up be possible? It would certainly be exciting, yes, but my key consideration was this: How would this tool help show and develop student thinking? When it came to the use of Edtech, the last thing I wanted was an e-version of worksheets, and have students hunched over blank after blank in their iPads in the gallery.